23" x 12" x 19"
The same Bag issued to German air force pilots to stow helmet, goggles, gloves, parachute and other equipment. A sure-fire hit for hauling hunting clothes, decoys, camping gear, and more. Pre-tested by troops, but with plenty of life left for the road ahead. 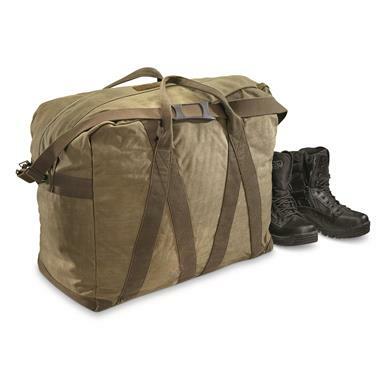 Dimensions: 23" x 12" x 19"
German Military Surplus Pilots Bag, Used is rated 5.0 out of 5 by 2. Rated 5 out of 5 by The FAL guy from Verry nice! Perfect for dirt biking gear,or whatever. Rated 5 out of 5 by Turk182 from Perfect size for Bunker Gear Bought this to transport my bunker gear for training. Boots, Pants, Coat, Helmet & SCBA mask fit perfectly. Well constructed bag, worth the money.